Hola Lexicans! First things first, remember to enter my giveaway, I have copies of RJ Palacio's Wonder to be received, so you can check out this post for all details - I will be shipping anywhere. 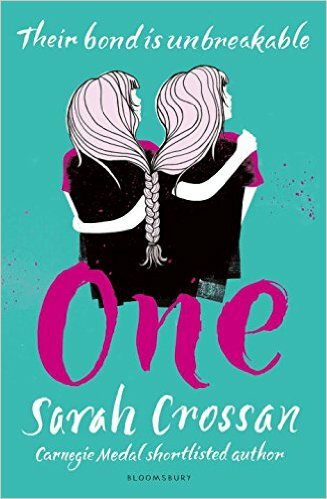 Anyway, recently I've been reading lots of different books that I've loved, and one particular book that I adored was One, by Sarah Crossan. You may have seen my review on Apple & Rain by Sarah Crossan, which I really enjoyed, so when I heard she was releasing a new book, namely One, I got very excited. Meet Grace and Tippi, two inseparable twins. Literally. Conjoined by the hip, these two are far from, whatever normal really is. And for the first time in 16 years, they are actually going to school - it won't be easy, not when we live in a world full of staring and laughing behind people's backs. One, yet Two. Completely different, yet too similar. One is outspoken and loud, the other quiet and serious. This book is emotional, stunning and made me think so much. It's actually written in free verse, a type of poem but without rhyme or rhythm, and being not a big fan of poetry, it put me off when I first saw it. Within 9 seconds I was gripped. Often I skim-read, but this really made me slow down, think and feel the emotion. The book is taken from the point of view of Grace, the more sober one of the two. The writing, like Apple And Rain is simply beautiful, gorgeous and appears effortless. It makes the reader think just what being a 'siamese' twin really is, when I told my best friend EB, she said it would be 'cool'. Reading this book really made me disagree - when Grace had the flu, Tippi had to stay in bed even though she was fine, and they'd never be able to fall in love, for obvious reasons., although the point of the book isn't too make us feel sorry for conjoined twins, it's more to make us realise the struggles, and how they are different people, who just happen to share a body. I'd definitely recommend this to everybody my age or older - that includes teenagers, YAs, adults and the elderly, I can pretty much guarantee you will love it! This sounds amazing, hopefully it would be in my school library or something! Sounds like something I would read, if only I had more time on my hands, ugh, high school! Thats sounds like a really cool book! Wow, this book sounds so good! I will definitely have to give it a read sometime. :) By the way, you have been tagged for the 20 TYMNKAM Tag! Yes, I had to abbreviate it because the title was too stinkin' long. xD Thanks Lexie!